Flow is definitely coming – less than a month and the best music festival of Finland (even Nordics?) is here! Flow is music festival here in Helsinki and it is ALWAYS a weekend when we’ll send our kids to their grandparents and spend our weekend listening music and enjoying great Flow-feeling with our dear friends at festival. Since we are living in downtown Helsinki we’ll invite friends over for whole weekend to sleep, enjoy breakfast and preparty listening best artists from flow-app before entering to festival. Flow is in Suvilahti, Helsinki. Place is easier to understand when I tell it is in Kallio-area near to metro station Sörnäinen. Kallio is 2-3 kilometers from Stockmann/Railway station so really in downtown. Easiest way to get there is to bike (there is a “bike lot” in front of festival with thousands of bikes, love it!) but if you don’t have one just walk or take metro or tram 7A/7B/6 (step out from tram also in Sörnäinen). Festival area itself is a pearl – location is just great and old pretty buildings and gas holder creates a “post industrial feeling” which ensures atmosphere is just perfect. Festival is pretty trendy place – you can see beautiful people wearing interesting cloths (no heels however since best to walk around with flats) and you can taste different delicious foods. There is always also art, this year video installations. Of course the main point is music – there are several stages with different artists all the time. This year I am waiting most for Lana Del Rey, London Grammar and always so great Alma (a Finn you should listen a bit right away if you don’t know her!). Age limit to festival is 18, I would say most people are 30-45 years. Days for festival this year are 11-13.8.2017. If you plan to enjoy the festival, I suggest you buy your tickets now since normally at least some days are sold out well in advance (however not yet when I am writing this). More information of festival you find here. There are lots of information also in English. Also I guess – since me and my friends Anne and Marjo love Flow festival so much, we’ll write more about this before the festival. Pictures here are from last year. Best carneval time in Helsinki (and in Finland) is around first of May. Celebration starts already some days before – you can see groups of students wearing haulers. However, the real “vappu” and big celebration starts early evening of 30th of April. At 6 pm thousands of people want to see when statue Havis Amanda (situated between Kauppatori and Park Esplanad) will receive her “graduation cap”. After that as well as before there will be thousands of people in down town Helsinki celebrating. Most people wear their “graduation caps” (but only after 6 pm), drink sparkling wine and buy some air balloons. Overall feeling is positive and springish (even it would not be warm and sunny at all) and bars are very crowded. Recommend to be somewhere near Havis Amanda around 6 pm and after that visit at least Senaatintori and arounds. After these “must dos” you can have fun evening in bars – but it will be very crowded everywhere. However – don’t party too late since best part of May Day celebrations happens first of May. First of May it is best to be in Ullanlinna (Ullis) and Kaivopuisto (Kaivari) already 9 am (doesn’t matter even you are not looking your best and smelling a bit of sparkling wine) since there will be choir singing and May Day celebration “officially” begins. All the day long there will be thousands and thousands of people having picnics and wondering around. You should have your own picnic snacks with you as well as some sparkling wine since there is not restaurants – idea is to have those with you. Everyone just spends the day meeting friends and having fun. Students were haulers, almost everyone have their “graduation hats” (but you can come without – no problem) and children have their balloons – what a perfect day! Remember to wear warm cloths since Kaivopuisto is next to sea – there can be very cold. See you in Kaivari on Monday! One of the most interesting music festivals in Helsinki is definitely Flow festival. It’s a perfect way of getting tuned into Helsinki’s artistic and relaxed atmosphere. The festival takes place from 12th to 14th of August – just when the evenings start getting darker and festivals better. Each Finnish city has its own music festival and Flow is the one to visit in Helsinki. You can buy the tickets already now and get to know the artists playing in each stage. Yes, don’t worry if you don’t know a single band on the list – it’s a great opportunity to explore some new music and just enjoy the atmosphere. The Flow festival has been organised since 2004 and it has grown its popularity every year reaching over 70,000 visitors. It’s been organised in old power plant area in Suvilahti which a unique and convenient area for an urban festival. Flow is a nice experience also to someone interested in food. There are several nice restaurants offering food for all tastes; vegetarians, organic and sustainably produced food. As Rasmus told earlier this week, Uisge Whiskey Festival was held at Vanha Ylioppilastalo (old student house) in Helsinki this weekend. I made a list of the best things at Uisge 2016 – naturally from a Finnish point of view. 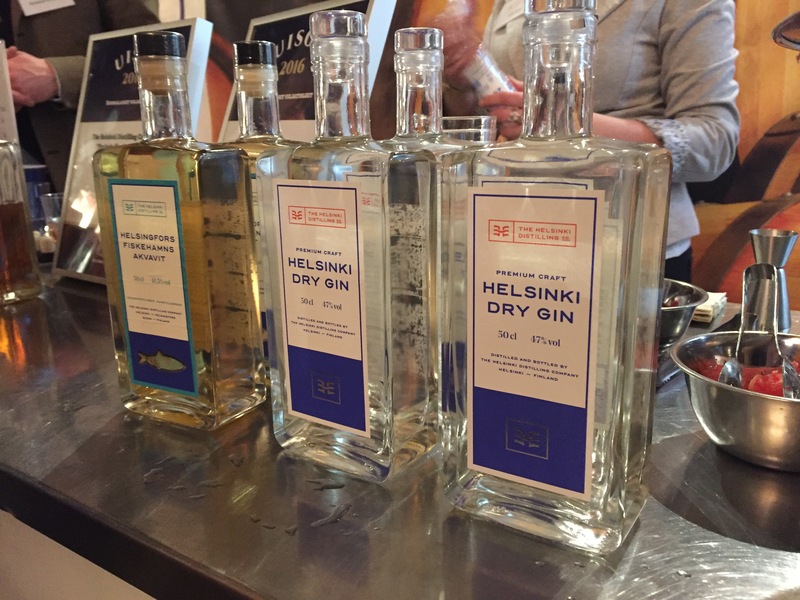 One of the newest distilleries in Finland that I am aware of, Helsinki Distilling company participated the Uisge festival for the first time. The whiskeys are still young and they actually had a 1 year old Prelude Single Malt available for tasting. I had a taste of it and to be honest it wasn’t too bad. Let’s see where they end up in the next ten years or so. In the mean time you might want to try their Helsinki dry gin and Helsingfors Fiskehamns Akvavit and long drinks (ready made mix of gin and juice). At the corner of a stand stood a young man promoting quite unique whiskey glasses he had designed. Matias Lehmusjärvi, a industrial design student, told us the story how he wanted to create a handmade glass and ended up collaborating with a Finnish glass factory Nuutajärvi. His whiskey glasses are all unique and made in patches of 50 glasses after which the glass mold needs to be renewed. In other words each patch is different and since the glassblowers manufacture all glasses one by one, no glass is exactly the same. Well there isn’t much to say about Valamo Monastery Distillery yet (since it was established 2014), but I did find it quite interesting to notice that a monastery had also caught up to the new distillery wave here in Finland too. According to Wikipedia, The annual capacity of the Valamo distillery will be 120 000 litres, and it will be the biggest distillery in Finland in the future. I have to keep this distillery in mind in the future. Specially selected to celebrate 10 years of Friends of Irish Whisky (IWY, Irlantilaisen Whiskin Ystävät), Midleton was one of my favourite whiskies at the whisky Festival. It is available at Alko’s whiskey selections but with a limited availability. I heard that there are about 70-80 bottles left and the price for a bottle is a bit over 200 €. Nevertheless, I do think it’s worth it and would consider buying on if I had any extra at my bank account at the moment! p.s. I would also recommend trying out Teerenpeli Distelliry’s whiskies if you’re in Finland. 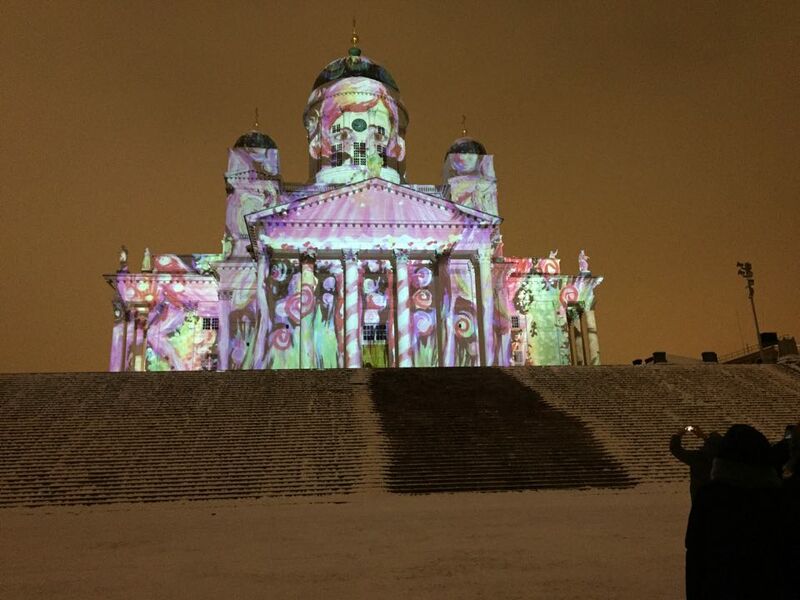 As Anna wrote last time, we had a light festival Lux Helsinki in the city center last week. This wasn’t the first time we had Lux Helsinki, but this year the light festival was a huge success, over 600 000 visitors walked through the parks and streets and saw the light installations. I walked the route yesterday evening and made a short video with time lapse from it (bare with me, I’m still learning how to use my Polaroid Cube+). If you’re planning on coming to Helsinki next year especially during winter I would most definitely recommend checking out Lux Helsinki’s time table for next January and if it will suit your travelling plans! 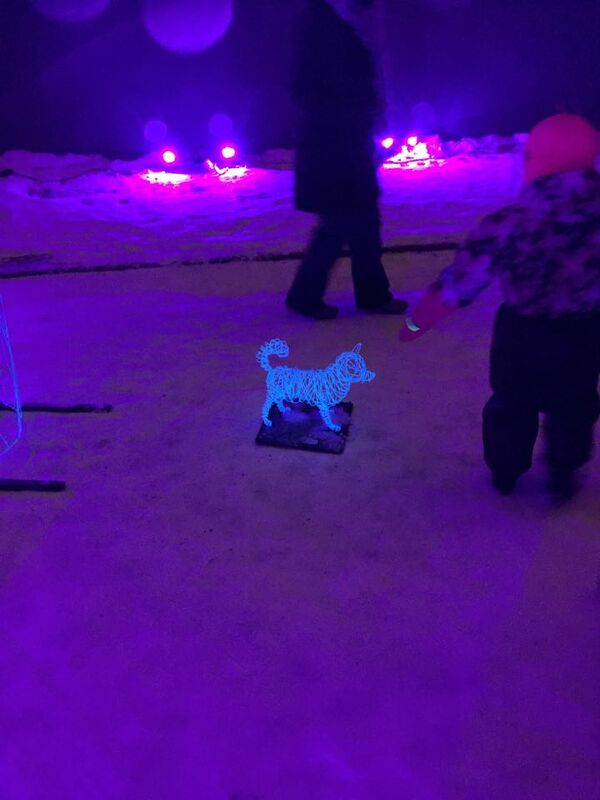 At least I was surprised how good it was this year and how well all the light installations worked in snowy Helsinki.